The Society for the Preservation and Advancement of the Harmonica (SPAH)convention in Denver, Co., was fantastic. The next one is scheduled for Milwaukee. Hope to see you there! The Americana Gospel seminar was wonderful on all counts. It was a wonderful combination of instruction and beautiful playing by everyone involved. The harmony seminar was moderately attended by folks seriously interested in learning about harmony. The initial set up of the room nearly killed my plans for using a roll-out keyboard as a visual and audio aid, but a quick suggestion from Paul Herzoff (attending the seminar) and the generosity of the Suzuki harmonica folks saved my visual/audio aid. I wanted to show the lead/harmony relationships between the notes on a keyboard layout because of its graphic nature and I have a small, rollout keyboard that would have done that well if the easel and white board had arrived for my seminar. However, a miscommunication in the hotel staff left me without the board and easel, so my keyboard had no semi-vertical flat surface on which to operate. Paul suggested that the Suzuki folks might allow me to use one of their melodicas for the prop, instead. They did, and so I am ever so thankful to the Suzuki folks for their help in making my harmony seminar a success. Harmony can be a difficult subject, and without a board to write on or a keyboard or other graphic prop, it can be very hard to explain what is going on in a reasonable space of time. So, thank you Paul and thank you Suzuki harmonica for your help. Guess what we had at the harmonica convention: bluegrass jam sessions. In Jason Ricci's words, "The word is, this is the 'happenin' jam." Thanks to Lonnie Joe Howell, who can keep rhythm while playing in a rack, and my bluegrass friend from Ft. Collins, Susan Dailey, who sang with us and kept a mandolin presence in the jam on Friday night, we had a grand time and were visited by a great many of the other harmonica players, including many of the performers, like P. T. Gazell, Robert Bonfiglio, Clay Kirkland, Jason Ricci, and many more from all genres of music -- including some bass and chord harmonica players who were learning to apply their skills to a music that is primarily dominated by stringed rhythm musicians. We had a blast. I hope we can do it again in the future. The bluegrass teach-in worked out well, too. I was busy the entire time working with different folks on different aspects of playing the music and working with the other musicians, eventhough we are harmonica players. We are looking forward to having a bluegrass table in the future, too. Jimi Lee's jam session were just as great as always, too. Everyone got their chances and the music varied from the 12 bar blues to some old jazz standards, including one country/bluegrass tune. Later on in the evenings, these folks would get another chance at the blues at Buzz Krantz' blues jam (after the evening's shows). The shows and seminars were great. The jams were great. The German Harmonica Museum exhibit was great. In all we had a wonderful time. 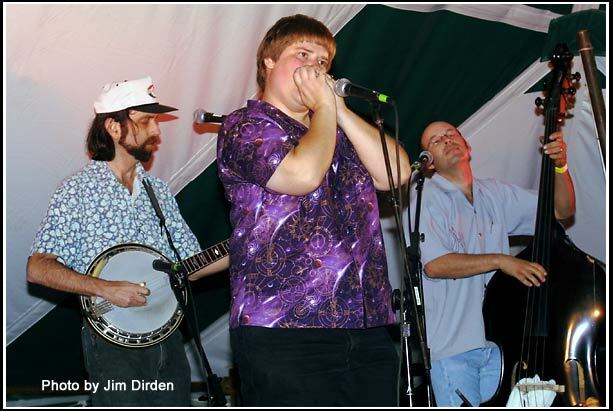 Visit the webpage of harmonica legend, Lonnie Glosson. Known as the "talkin' harmonica man", he fascinated audiences with his harmonica from the stage and over the radio until the age of 92 (a testament to the healthful benefits of playing the harmonica and of playing music in general). From the 1920's to the 1950's he traveled the country playing the harmonica in shows and on the radio, including a bit on WLS Radio (Chicago) and the Grand Ol' Opry. He even found himself on the television show "Hee Haw" in the 1970's. With his harmonica playing partner, Wayne Raney, he wrote the song, "Why Don't You Haul Off and Love Me." Lonnie's composition "Matthew 24" has been recorded by both Kitty Wells and George Jones. Camp Bluegrass & Swing Camp are done for 2006 -- They will soon be gearing up for 2007! Camp Bluegrass & Swing Camp 2006 took place during the week of July 16 through July 21, 2006, and will be held again next year during a week in July on the South Plains College campus, 1401 College Ave. Levelland, Texas 79336. This year's Camp Bluegrass' faculty will included Alan Munde, Wayne Shrubsall, Ned Lubericki, Bill Evans, Adam Granger, Chris Jones, Roland White, Steve Smith, Gerald Jones, Joe Carr, Ed Marsh, Dale Morris, Sr., Steve Williams, Kathy Chiavola, Dee Dee Wyland, and Bill Honker. It was a blast again this year, and a lot was learned. Swing Camp (with Slim Richey) was also a blast this year and will be again.